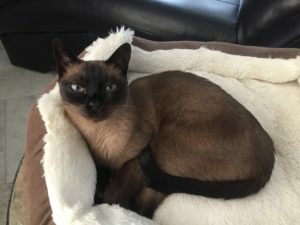 The Checkup, Part 2: Hershey's Diagnosis of Feline Hyperthyroidism | Purrrfectly Holistic Purrrfectly Holistic…a Boutique for Cats! Taking your cat to the vet for a wellness checkup may not be part of your annual routine, and I can certainly understand why most pet parents don’t do it. You may recall that last week I took four out of five of our cats to the vet for their annual wellness checkup. I had blood work done on my three oldest to get a glimpse into what’s going on inside their furry little bodies. Last week I focused on Gunner’s results and the new protocols in place to help him. This week I want to give you an update on Hershey’s test results and natural alternatives for treatment and support. Like that proverbial piece of mystery chocolate in the box, Hershey’s blood work results came with a couple of surprises, too. The last time he had tests were a year ago when he had his teeth cleaned. Potentially, a lot can change in a year! The biggest not-so-big surprise to me is that his thyroid levels, T4, were higher than normal: 5.1 (normal is .8-4.0) Translation: hyperthyroid. This certainly confirms why he seems to be hungry a lot and can eat more than anyone else. He’s lost a little weight over the past year, too, but nothing dramatic. While most pet parents would opt for the traditional route of medical management using a drug called methimazole (Tapazole), surgery to remove the adenoma, or radioactive iodine treatment, I chose a different path. 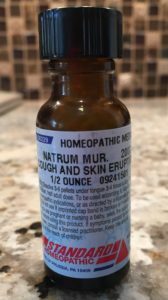 I did a lot of online research and came across a fascinating study where 13 cats were given one dose of a homeopathic remedy called Nat Mur 200c (Naturum Muriaticum), and it cured 8 from their hyperthyroidism! Wow! I would much rather $20 on this remedy and avoid drugs with toxic side effects or expensive surgery if would work on Hershey! Before I ordered this remedy online I muscle-tested Hershey to see if it would be beneficial and effective for him (it was). I dissolved one pellet in reverse osmosis water and gave him 1/4 ml orally, which he took like a pro. To continue to support his thyroid for awhile he’s taking an herbal supplement from Pet Wellbeing called Thyroid Support Gold. How does this happen to begin with? This diagnosis left me scratching my head wondering what causes hyperthyroid to develop in the first place. 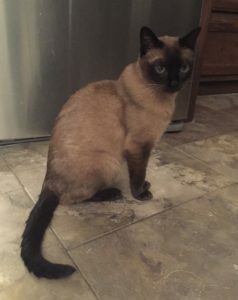 A couple of things jumped out to me that you may find interesting and helpful if you’re concerned about this disorder in your own cat. Exposure to flame retardant chemicals (polybrominated diphenyl ethers, or PBDEs) through house dust. PBDEs are recognized endocrine and thyroid disruptors. Eating fish-based cat foods. 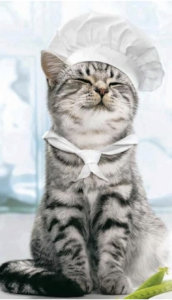 Apparently “marine organisms produce PDBEs naturally and can bioaccumulate up the food chain to high levels in fish; this compounds the exposure cats get from fabrics and dust. Canned cat foods that have liners using BPA (Bisphenol A). BPA is a known endocrine disruptor, and studies have now connected this chemical to hyperthyroidism in pets. Check to see if the canned cat food you’re feeding your furbaby uses BPA liners here. My plan is to minimize the amount of fish-based canned cat food in our household and focus on supporting brands who chose not to use BPA liners in their cans. I’m already a neat freak, but keeping the house dust-free is nearly impossible with two humans and five cats living here! The other surprise I got was that Hershey’s liver enzymes were slightly elevated–just like Gunner’s! After muscle testing all possible causes (you can read those in last week’s blog here) it was determined he just needed a cleanse, too. 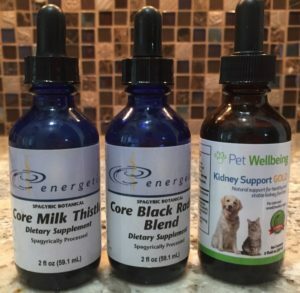 Therefore, he’s following a similar protocol as Gunner with two products from Energetix: Core Milk Thistle (21 days) and Core Black Radish Blend (7 days). He’ll be turning 16 years old in August, and it’s no wonder his liver may be a little sluggish after all these years! I’m also continuing to monitor his elevated kidney levels. His BUN levels were 49 (normal is 14-36). While this is probably due partly to age and that he eats a partial raw diet, he also used to eat a kibble diet for several years before I got smart and banned it from my house. I’m using Kidney Support Gold by Pet Wellbeing, an herbal supplement twice a day to give his kidneys extra support. Hershey was diagnosed several years ago with pancreatitis which we control by adding digestive enzymes to every meal. This time his Amylase levels (pancreatic enzymes) were a bit high, 1558 (normal is 100-1200), so I’m increasing the amount of enzymes with his meals. Thankfully it’s a rare event (maybe once a year) for any pancreas flare-ups, and he’s been pretty much symptom free for about five years. I found an article that described how high amylase levels can be connected to kidney disease, which would make sense in Hershey’s case. We will go back to the vet sometime in June to do another blood panel and recheck his values. I’ll also be rechecking all his supplements periodically to see if I need to make any adjustments. Now that I know what’s going on inside him I can stay ahead of the game! In my world it’s about prevention and treating the cause. It’s no fun to chase a disease that’s full-blown because by that time you may be limited in options for treatment, not to mention the expense and stress on your cat–and you! Next week I’ll share Lili’s results. If you have a cat with CKD, chronic kidney disease, be sure to tune in. Check out this great article I found on how to make sense of your cat’s blood profile report. It breaks things down to a level that makes it easy to understand. 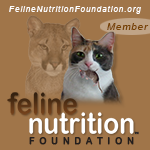 Do you have a cat with hyperthyroidism or liver enzyme levels that are concerning? Would you like me to do a complimentary muscle testing evaluation for possible treatment alternatives or supplementation? Leave a comment below! Don’t miss out on our posts! You can sign up here.